Thank you heaps to you and your band for last night… The feedback has been awesome – everyone really enjoyed your music! Thank you just isn’t enough for all of your support You all made this night amazing & by the sounds of it we will be doing it again next year! I’m one of the bridesmaids from Abby and James’ wedding on Saturday. You guys were fantastic at the wedding! I want to book you for my 21st! Lara and I want to pass on a huge thank you to yourself and the band for saturday. We received many comments about you guys and all of them were universally positive. Everyone loved your song choices, and the Italian song ratio was bang on. Your accordion player was a highlight for many people too. We thought your playing volume was perfect as well – we didn’t need to worry about a thing. Thanks also for your MC skills. People knew exactly what was going on and the evening flowed nicely. We hope you all enjoyed the food, and that you had fun playing for us. A very big thank you for entertaining our wedding guests with your fantastic music at our wedding reception on 7 December 2013. We enjoyed working closely with you to put together playlists for the reception. It was wonderful to have your pianist curate a list of contemporary music to play during canapés and pre dinner drinks. We are so gratified that you learnt many of our requested songs. The music on the night was perfect and included a mix of classical and contemporary music with everyone kicking up their heels on the dance floor to a live music concert experience. One of our most memorable moments from our day was our romantic first dance to Etta James ‘At Last’. Thank you for coming to Pinnaroo on Sunday! My sister and I love dancing to your band. We are both addicted to music and dancing so keep up the beat. It was great having you play! Best of luck to you and the band for the future! Tony Genovese…. you were FANTASTIC!!! Everybody loved your music!! Thank you so much!! I would happily have you at every function…. I look forward to having you here a lot! Hello Tony, Was a great night – thanks to everyone in the band. Talk soon. The band on both days were delightful to work with – very friendly and communicative. Their interaction with the crowd was great and we appreciated Belinda spruiking our social media tags on the Sunday as well. I believe that 1 lady did buy the band a bottle of wine to say a big thank you on the Saturday – her group were up dancing and really appreciated the music. This band were a real crowd pleaser, I’m so glad we chose them for our work Christmas party. They played in front of a crowd of 180 and everyone was happy and dancing! They were great to deal with and really flexible and worked with our dinner arrangements. Thanks again for entertaining us! I had the best time, danced all night, as was the plan! Everyone loved you guys and the choice of music. You sounded fantastic and appropriate for the area. Jordan and I would like to thank you and your band for your amazing effort and performance. It made the night fun and special, we couldn’t ask for anything more. The music you selected was great and all of our family and friends really enjoyed themselves. So many commented on how great you were! Also thank you for being our MC, the night ran really smoothly and we were very happy! We will highly recommend you to others. Thank you again. We were so pleased that you were a part of the 2016 Disability, Ageing and Lifestyle Expo, you were all absolute entertainers, and I would like to sincerely thank you for all the effort you put into making your performance a memorable event. Your friendliness and professionalism surpassed our expectations and we look forward to collaborating with you again in the future. Thank you again for making our event so wonderful for so many attendees. Fantastic night !! You guys were amazing and are so talented !!! Thanks for being a part of our mid-year work function! To you and your band members many thanks and everybody present have been extremely impressed. All the best and will keep you in mind should something else come up. (Feedback for Mambo Italiano Show) Great night, food good but it was the band and the atmosphere that made it great. Brought back memories of our youth, the parties, weddings and we knew the words and had a great time dancing. Lino Cardone, Tony Genovese, Sophia Kontogonis, Nigel Jackson and Frank Fragomeni produced an amazing sound. We encourage you to get to one of the last 2 remaining Shows! Hey Tony, thanks for Saturday night (my 50th). We all had fun. 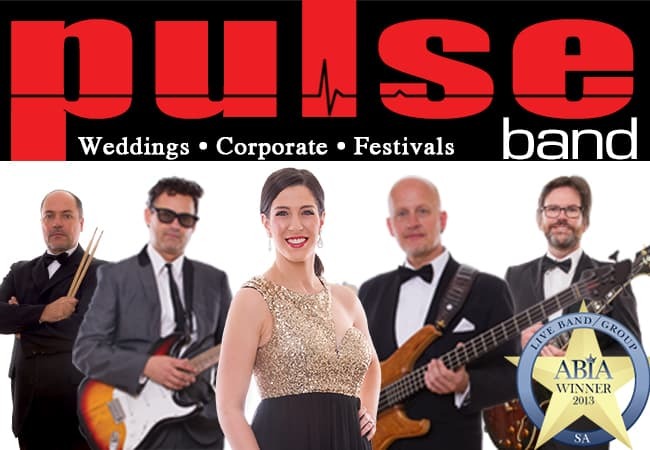 We had Pulse band perform for my Father’s 90th birthday party and we highly recommend them. Great music, very professional and they know how to involve the crowd. Everyone who attended thoroughly enjoyed themselves. A day to be remembered. Thank you Pulse for helping make this wonderful day!!! It was really nice to work with everyone over the weekend, it was such a lovely atmosphere! I think regarding our site, I found that the duo and trio definitely suited the venue better for these types of groups. We look forward to being able to work with you in the future. I just wanted to pass on my sincere thanks for performing at our AGM Dinner on Saturday night. We have received lots of great feedback about the band and were so pleased overall with the service provided. We will definitely keep your contact details for future events. Thank you for a great night once again everyone enjoyed themselves be in touch for the next one! Thank you Tony for making it a brilliant party night for me. I loved the whole night from beginning to end. Everyone got up and danced, as your music inspired them. We used your band services this year in May at our Volunteer Luncheon and loved you! We were hoping to book you again for next year if you are available. I wanted to personally thank the band Saturday night – but didn’t get a chance. They were fantastic – by far the best cover band I’ve heard and were great on the night. Please let the band members know for me that I had an absolute ball! Thank you! It was a great night. I’ve had ots of positive feedback about the band. Excellent background and dance music. And importantly, they were very flexible and fitted in well with the presentation night schedule. Just wanted to pass on our thanks to Jazzamatazz for their fabulous performance on Friday night. The event was a fabulous success and we are thrilled that you were able to be a part of the evenings success. We really appreciate your assistance and look forward to the possibility of working with you again in the near future. Kind regards. Thank you Tony. Great to work with you guys. Fab music. Love it! Just heard your band play very memorable songs (The Sensationals). Thank so much. Thoroughly enjoyed myself. My friend and I thoroughly enjoyed the Sensationals today at the Shedley. We were front row and the only 2 that got up and danced to the Nutbush. Thanks for a good show! Feedback from the party was excellent and everyone loved the band. I especially wanted to thank your lead singer for quickly stepping up the tempo to dance music when I asked. I was amazed at one point towards the end at how many people where on the dance floor – the dance hits just kept coming. I am excited about working with you and promoting what you do at our future events. Once again thank you for a wonderful afternoon on the 15th. Hey Tony, Thanks very much! The morning showers thinned the crowd slightly, but apart from that it was a great day! Thank you for sending us such professionals also. As always, Pulse kept the vibe joyful and they were a pleasure to work with. I look forward to working with you again soon. A very successful private function at La Vita tonight. So much laughter, good food, wine and music from Mambo Italiano! Thank you so much Tony for making my husband’s birthday night so special. Everyone loved you guys so much & they all had a great time. Thank you ? Thank you guys for the wonderful night, music was awesome we didn’t want it to end! We wanted to keep partying! You guys did a great job, thank you! A big thank you to the band – great party night at Tania & Tony’s wedding on Sunday! Have a great Christmas with family and friends.